Next year, as we’ve hinted at, we’re going to be relaunching Big Girls, Small Kitchen to be more user-friendly and comprehensive, adding new contributors in our Great Minds blog catergory, and a Guides section to house all our tips and tricks. We’ve been working for months, perfecting the site so that it will be a place that quarter-life cooks (and their friends!) can call home. There’s one corner of quarter-life, though, that feels just out of reach to us old fogeys–the college student. We were students just four years ago, but that sometimes seems like a lifetime, and it’s hard to remember the days of dining halls and care packages, of all-nighters with only the library vending machine for company, and dorm room parties with no space to move. So, we enlisted a bunch of college student cooks, writers, and marketers to get a new side of the site off the ground, one devoted to all things college and food. That will launch officially in February. For now, to kick thinks off, we bring you one of our college writers, Katherine Verville, with a Student’s Cheat Sheet to a New Year’s version of our all-purpose holiday finger food guide. Katherine is a senior at Bowdoin College, where she studies Romance Languages and Art History. She spent her junior year indulging in delicious food (and doing a little studying) in Lyon, France and Bologna, Italy. She lives in a house with ten other girls and one boy and, when she’s not struggling through a French novel, enjoys feeding them baked goods and family dinners. The holidays are almost over but you’ve still got one more chance for a last hurrah before those New Year’s resolutions kick in and you’re back on campus for the new semester. Though the holidays can be tiring – I mean, it’s a lot of family time after all – throwing a great New Year’s Eve bash doesn’t require much work. Instead of an elegant soirée, why not throw a laid-back (but still festive) get-together? Forget the blinis and caviar! Here are some simple ideas to make your New Year’s Eve party special. Set the mood: Whether you’re throwing down in your parents’ basement over vacation or back at school in your dorm room, a few simple touches can help create a festive atmosphere. Provide your guests with clear plastic baggies filled with confetti to help them ring in the new year. Decorate them with colored curly ribbon and arrange them on a table or tray for guests to grab as the clock counts down. Party hats and noisemakers are a must as well. And never underestimate the power of some streamers – I like metallic ones for a fun holiday like this one. 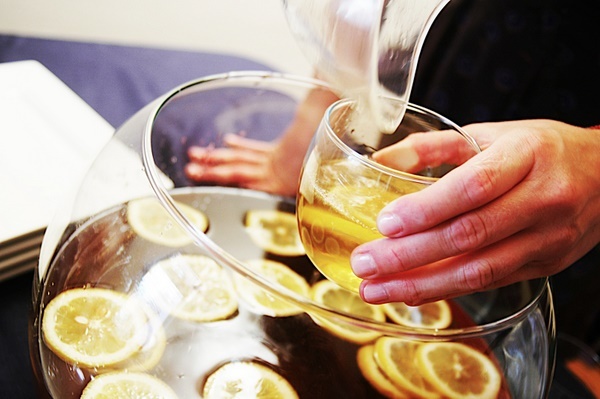 Drink: Punch is an easy (and festive) way to satisfy a thirsty crowd. Plus it will leave you, the host, free to mingle since guests can help themselves as they please. Here a recipe I have always loved; this makes a lot but, trust me, you’ll be glad – it’s a real crowd pleaser. Make sure you get an extra bottle of bubbly to open at midnight! Food: Rather than slaving away over fancy hors d’oeuvres or making a whole dinner menu, make a few simple finger foods that guests can grab. I like the idea of serving childlike bites, like Pigs in a Blanket, English muffin pizzas, or mini pb and j’s. Here are two other simple recipes that I will be using this holiday season. In a large punch bowl combine the pomegranate juice, pear nectar and orange liqueur. Slowly pour in the champagne (so it doesn’t fizz too much). Add a few handfuls of ice and serve. A great way to break your New Year’s resolution before it starts. These puffs are not healthy, but that’s why I love them. My mom always serves them while we decorate the Christmas tree – well, while my sister decorates the tree since I get too distracted by these delicious treats to be much help. In a mixing bowl, mix together the mayonnaise, cheese, and onion. Cut the crusts off the bread and cut each slice into fourths. the puffs are browning and bubbly.